Translating exceptional shopping experience into outstanding omnichannel sales. With signature product lines already distributed by a network of nearly 3,000 dealers, Decorative Films, LLC. was ready to offer its B2C customers a powerful new ecommerce experience. Miva designed a comprehensive ecommerce site combining a modern, conversion-optimized B2C shopping experience with breakthrough product visualization. Businesses which traditionally operate in the B2B sphere are now able to leverage cutting edge ecommerce UI to serve customers across every channel, device, and venue. Delivering stellar ecommerce to the B2C channel is now priority one for independent manufacturers already established in B2B. Decorative Films, LLC. is a market-leading manufacturer of professional grade window treatments under the trademarked brands Solyx and SimGlas. In addition to manufacturing its own signature product line, Decorative Films has also built a sales, distribution, and installation network partnered with more than 2,850 dealers in the U.S. and 7 other countries. With online sales already comprising nearly 20% of all purchases in the home improvement segment, this manufacturer-brand is well-positioned to compete on equal footing with retail behemoths like Home Depot via a first-rate ecommerce solution. For Decorative Films, helping customers visualize products which are traditionally challenging to imagine in real world applications was paramount. The new ecommerce solution needed to offer a premium B2C shopping experience with advanced visualization tools, comprehensive technical resources, and professional-grade control over product-specific sizing, quantity, and other attributes. Custom tools highlight products in innovative and effective ways for all customers, across every channel. Miva worked with Decorative Films to reimagine its existing web presence, creating a stunningly modern user experience. Beautiful photography and concise, engaging design elements create a cohesive expression of the brand on every page, while elaborate navigation tools promote intuitive shopping across a vast product catalog. A custom-built visualizer tool is a key feature of the new B2C site. The groundbreaking, amazingly intuitive tool helps clients see and select window treatments in a variety of real-world environments, while highly visual category content and tightly integrated social media combine to feature products in interactive, dynamic ways. As a result, retail customers now enjoy a premium showroom experience while shopping online. From the back end, orders are managed from a single admin interface which facilitates fast and effective fulfillment, flawlessly integrated with shipping provider UPS. 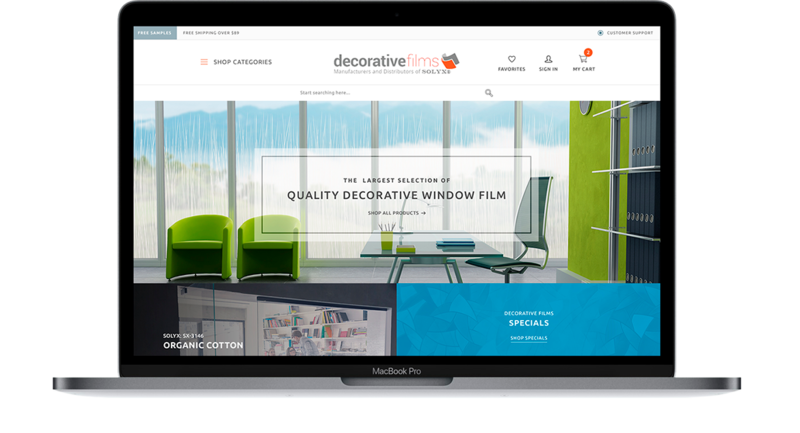 The new site supports Decorative Films large product catalog and diverse array of customers/shopping channels, with responsive design ensuring that the same high level of customer experience is consistent across all devices. A separate stand-alone site also connects professional customers such as interior designers and contractor partners with their clients, either on-site or remotely via tablet. A dramatic spike in average order value proves the power of purpose-built omnichannel shopping experiences. Mivas ecommerce platform enables Decorative Films to showcase its products with a conversion-optimized B2C shopping experience. Retail customers are clearly responding. Just 6 months after launch, the new B2C site has stoked an enormous rise in average order value, as the brands audience is able to vividly connect with more great products, more effectively. The responsive site design works beautifully no matter how or where customers choose to shop. The Miva teams comprehensive design and build, including 3rd party integrations, cost-efficient workflows, and all-inclusive hosting, provides the foundation for manufacturer-brands like Decorative Films to reach new audiences, beautifully.